I wonder what the “-” and “.” are used for… The “.” could be very useful for getting to the 7.5 floor in the Mertin Flemmer building. The “-” is used to go to the basement. I really don’t know and can’t imagine what the “.” is for. 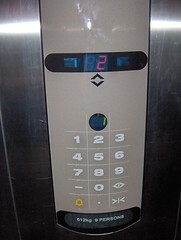 I hopped into the elevator tonight and poked it and it doesn’t seem to do anything. Haven’t seen any dwarves or portals in the building.